An exciting prospect has run into me yesterday. I am an avid fan of "The Sword of Shannara" series of books. 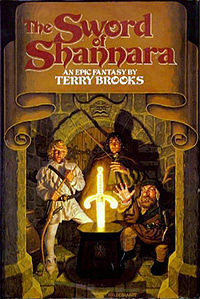 I am currently enjoying an audiobook of The Talismans of Shannara. Highly recommended. It seems that the rights have been purchased by Sonar Entertainment to make a series from the epic trilogy. I have enjoyed "A Game of Thrones", the televised pornographic version of the books by George R. R. Martin, and am bound to enjoy a televised version of this series as well.